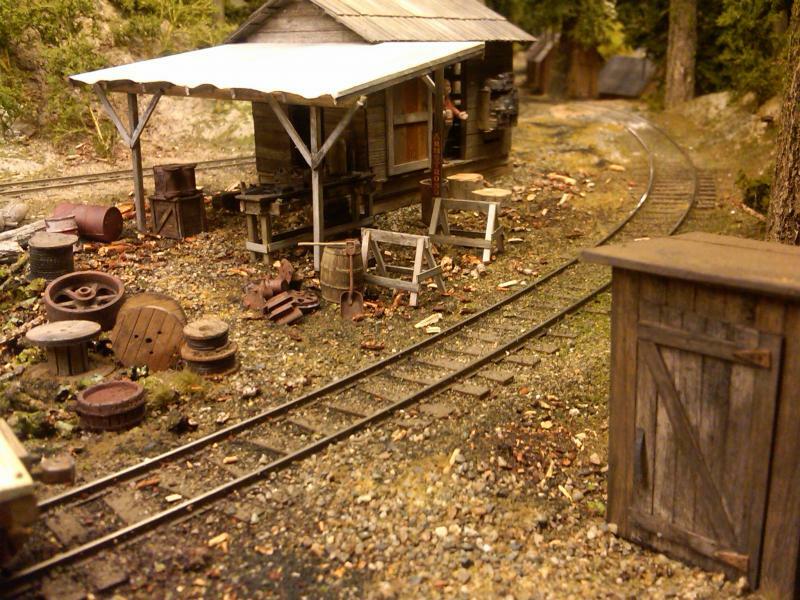 Updated July 27th 2012, people and small detail is the order of the day, spent a couple of hours today and will spend a few more tomorrow working on finishing detail in a couple of areas. 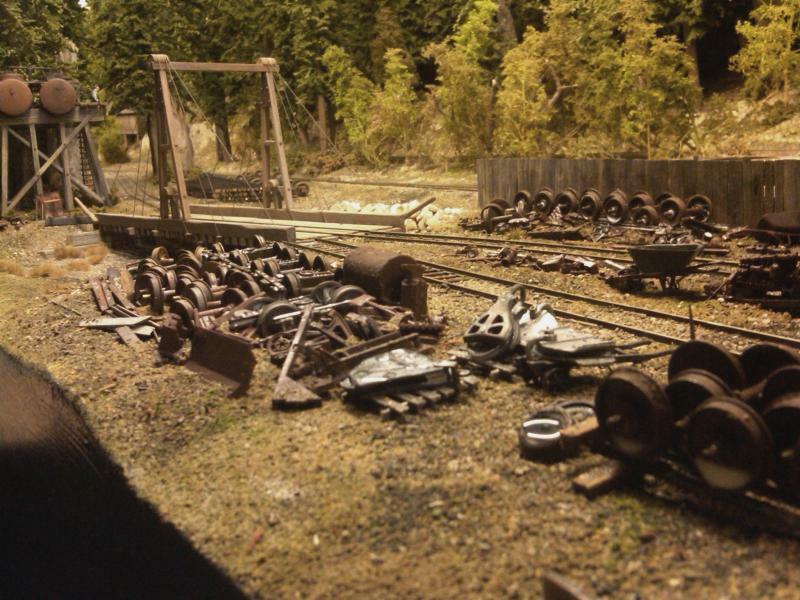 Updated July 25th 2012, so close, more areas nearing completion, end of next week will be time to reflect and just run trains as we prepare to go to the convention. 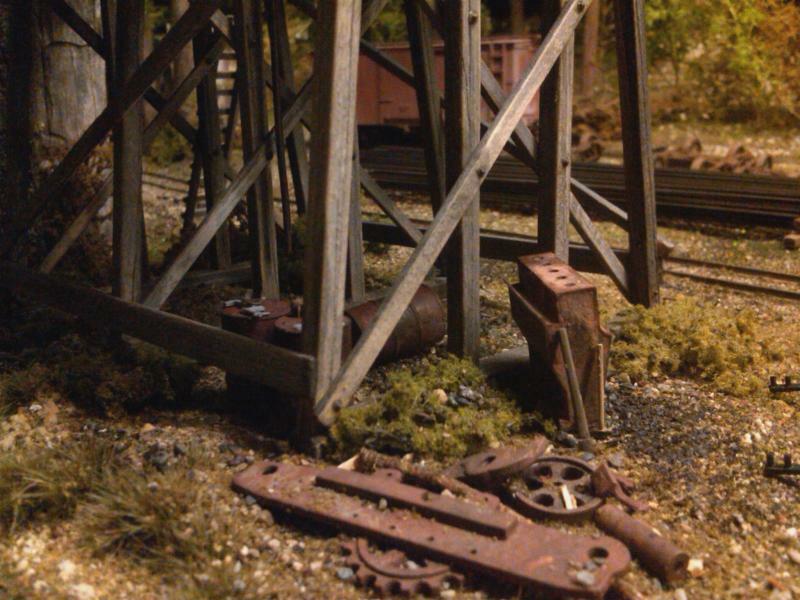 Updated July 18th 2012,Details, Details Details, adding detail parts all over layout, buffalo grass, cable, rail, chain, you name it. 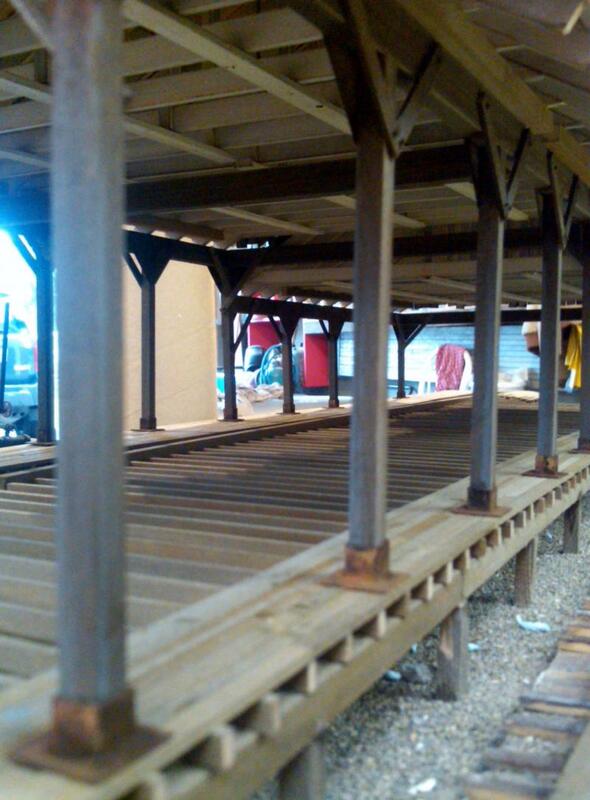 Stan bult the last structure for the layout a sled workshop that lives on the log loading area, here are some pics. 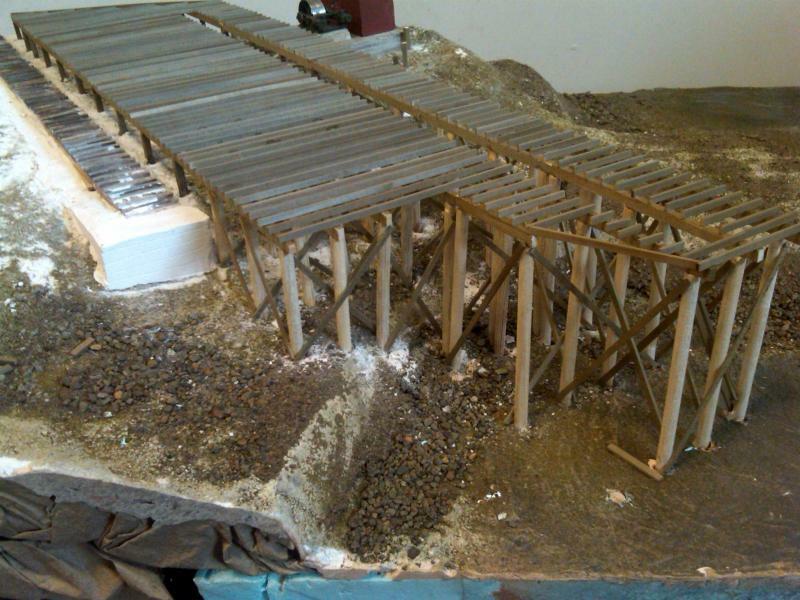 Updated July 2nd 2012, Homestretch as we would say, each week we get a little closer, we think we will pretty much done by end of July, here a few more pics of the detail that is being added. 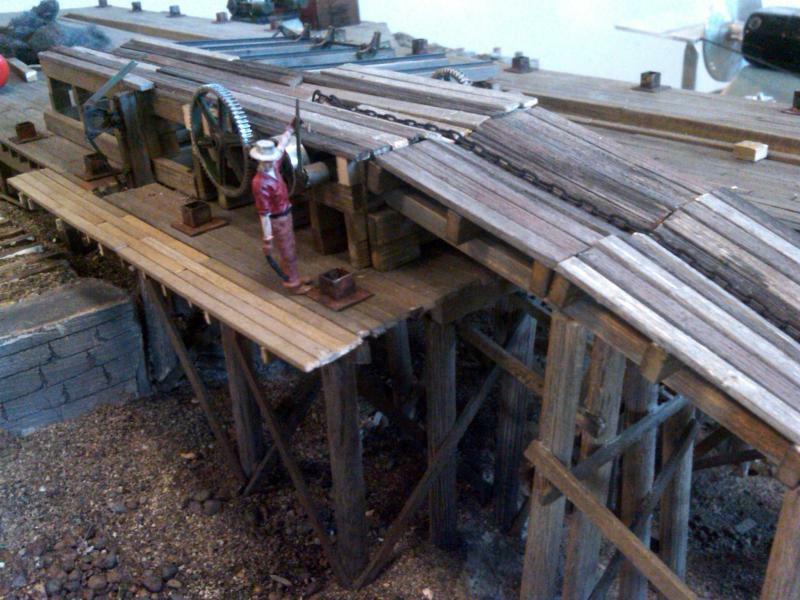 Updated June 16th 2012, Been working on the sawmill all week every spare minute, Stan completed the Lean-to roofs so I brought the base down to get things fitted. 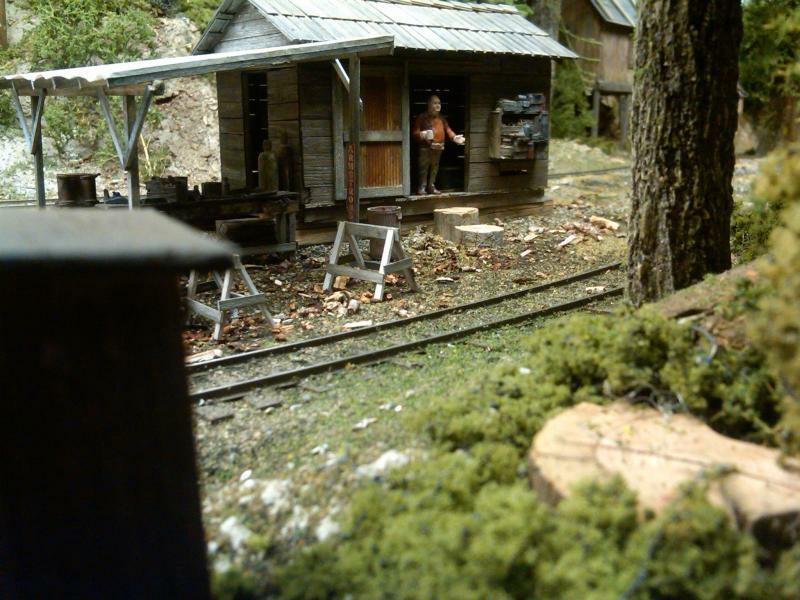 Brian took these great photos. 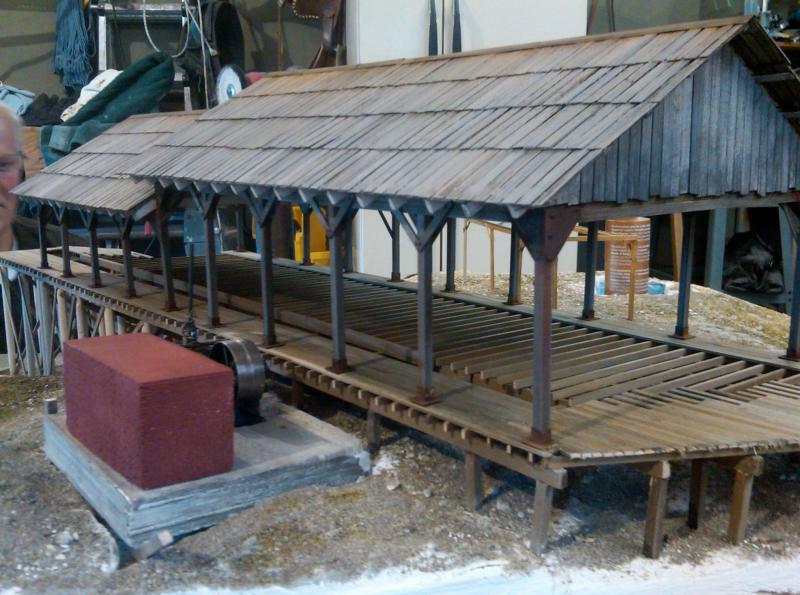 Updated June 9th, 2012, Should remame the post as The Sawmill Chronicles, here are better quality shots fom Brian and a couple of mine as Stan and I got the base and superstructure together one more time to place the wall footing supports and remaining measurements for Stans Lean to roofs, check out the lumber storage shed roof stan built, amazing modeling. 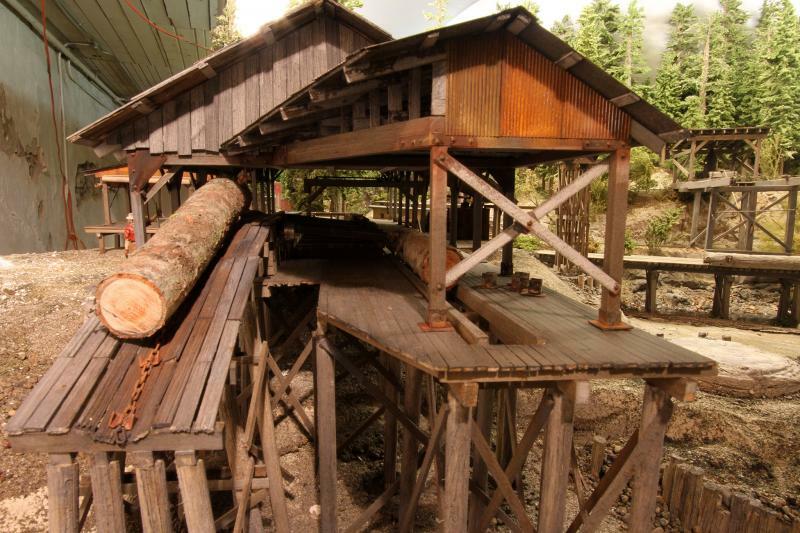 Updated June 3rd 2012, time to stop talking about it and get after building the sawmill. 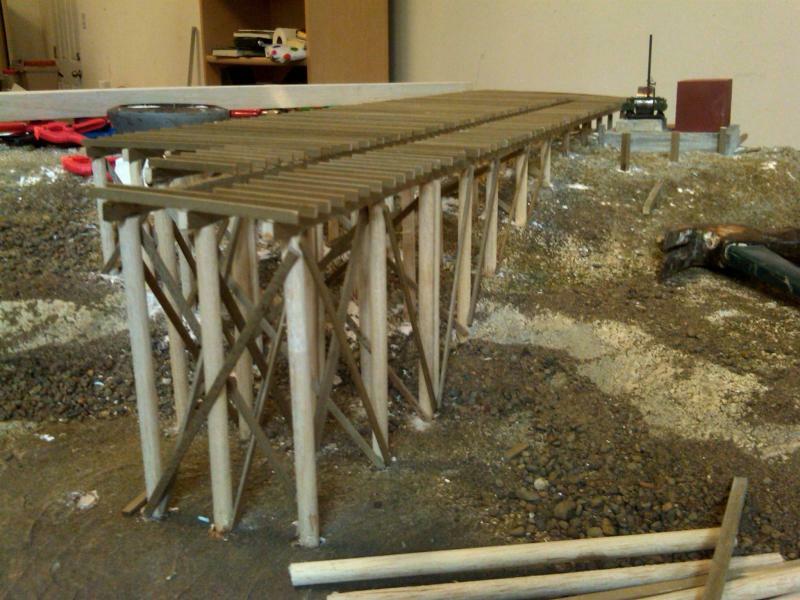 Stan the machine has the walls done already and all the trusses also. 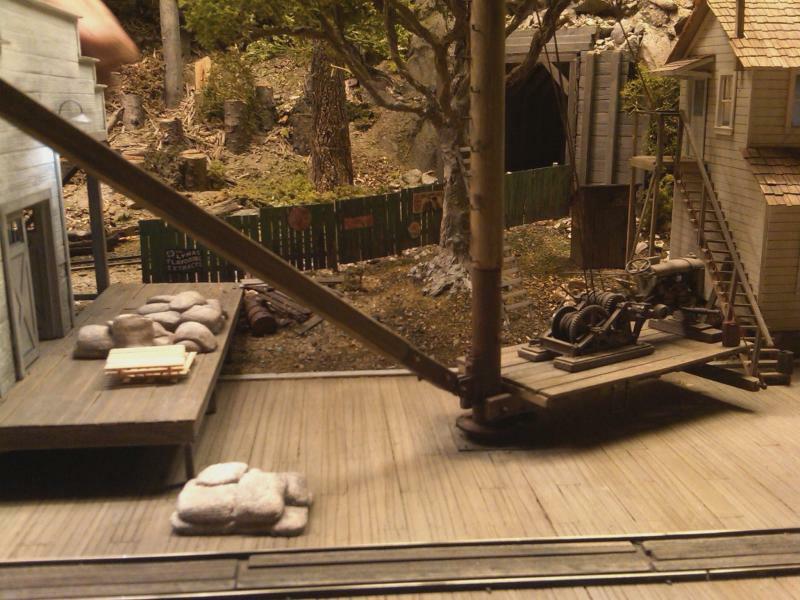 I been working on the deck , here a couple of pics, The mills name will be 30 Day Mill, becuse it needs to be done by the end of June for sure. 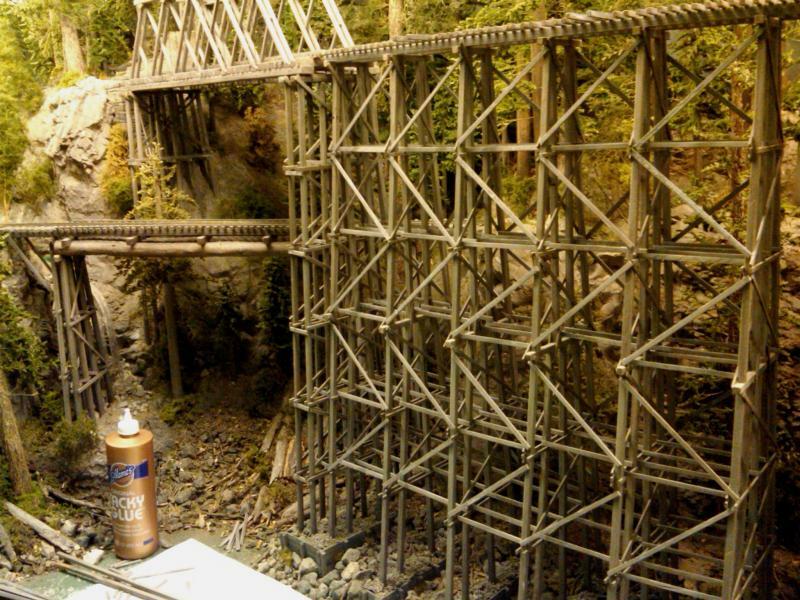 Updated May 27th 2012, completed the stringers on the 3 bridges in the canyon, Stan started walkways and Jim busy painting people, we are completing one section at a time, will complete the Canyon in the next 3 days. 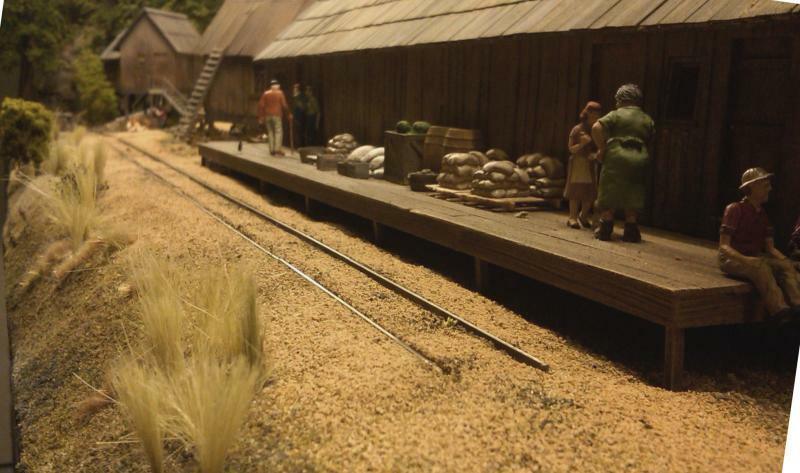 Adding details is great as we can discuss scenes and add life to the layout. 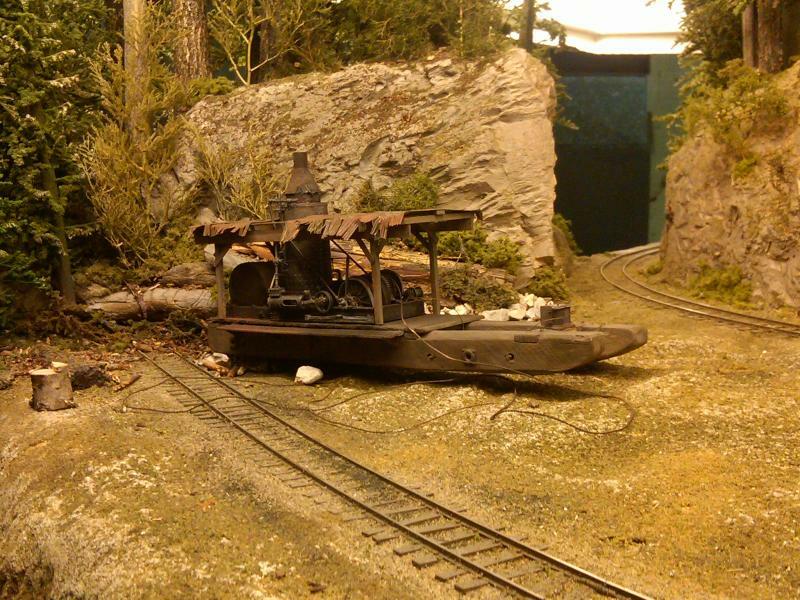 Fire Barrels and some birds on the bridge, a few ducks in the lake and maybe a local fishing for bass down by the trestle piers. 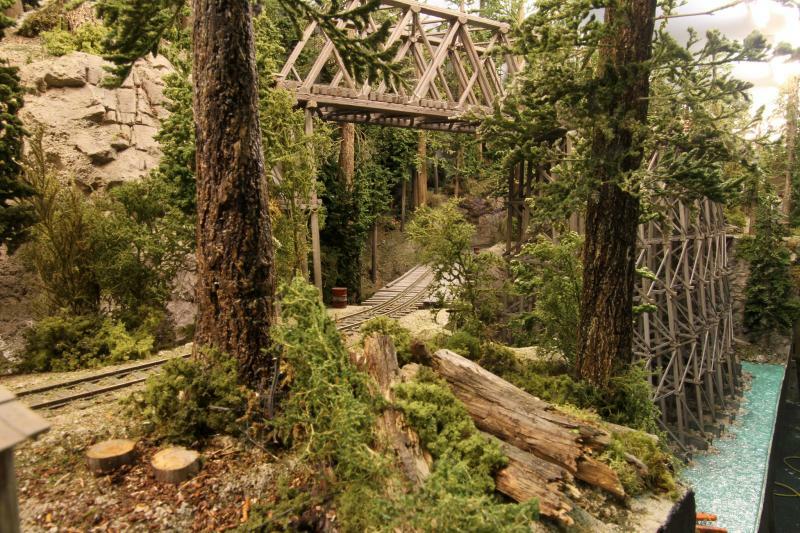 Canyon has very little left to be 100% done. 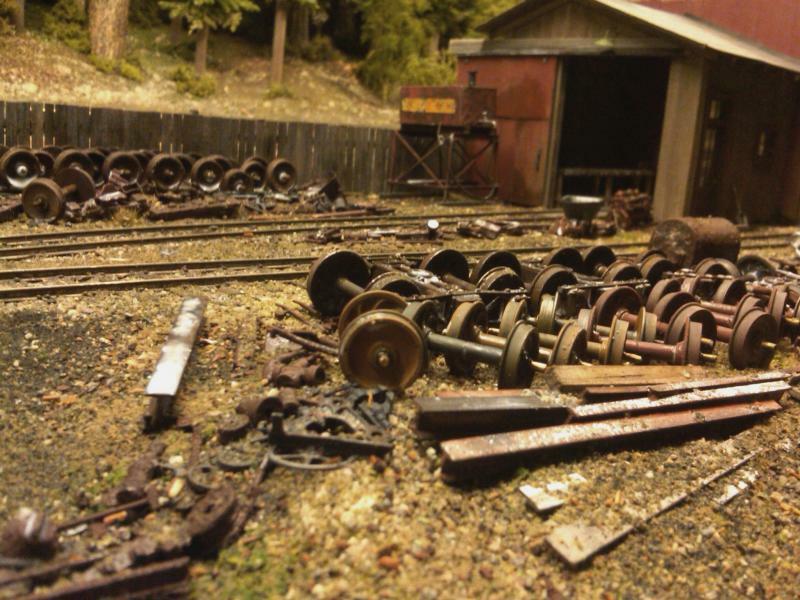 Updated May 19th 2012, Got in my usual Saturday AM session, Jim and I cleaned the layout room, what a friggin disaster, that took nearly 3 hours, we boxed up the leftover scenic stuff we will not need. 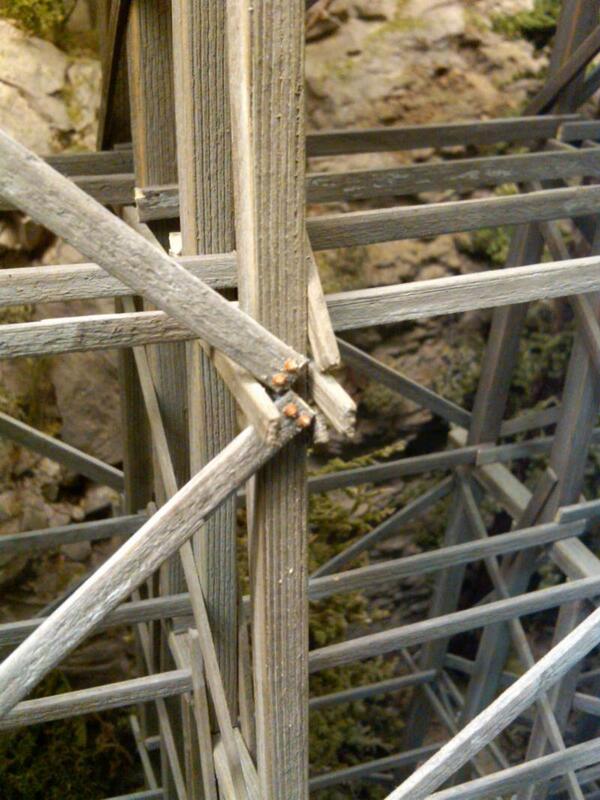 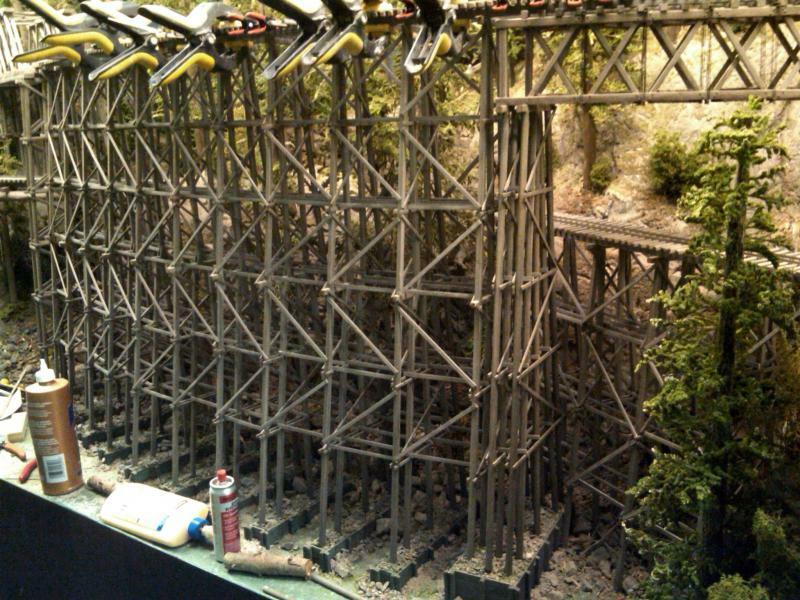 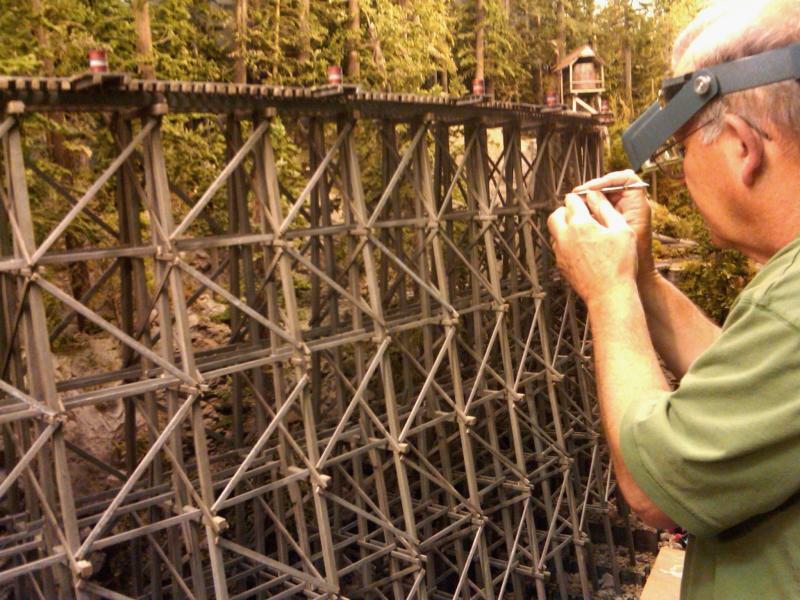 Spent the last couple work sessions on the canyon trestle adding stringers. 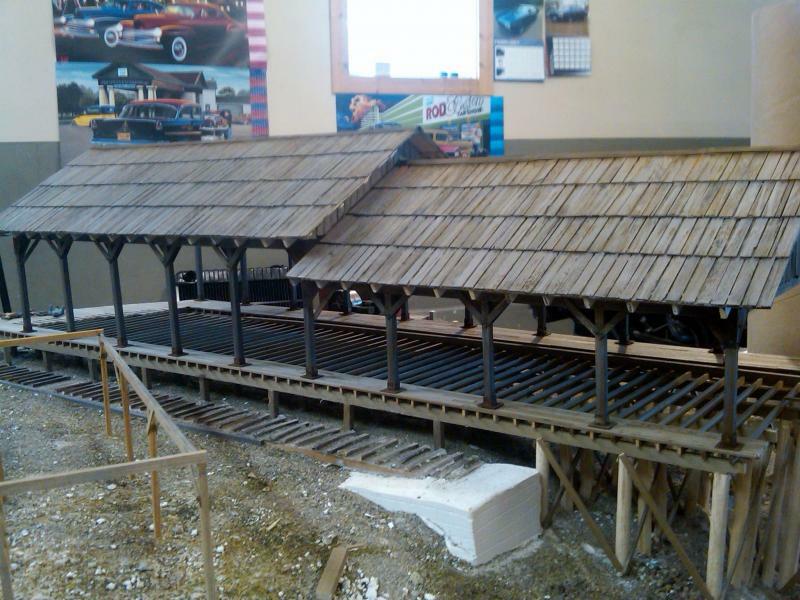 Updated May 15th 2012, Still adding some brush to layout, pretty much done, still some weeds to be added and grasses, but on to completing each individual section, added a trackplan to the History page. 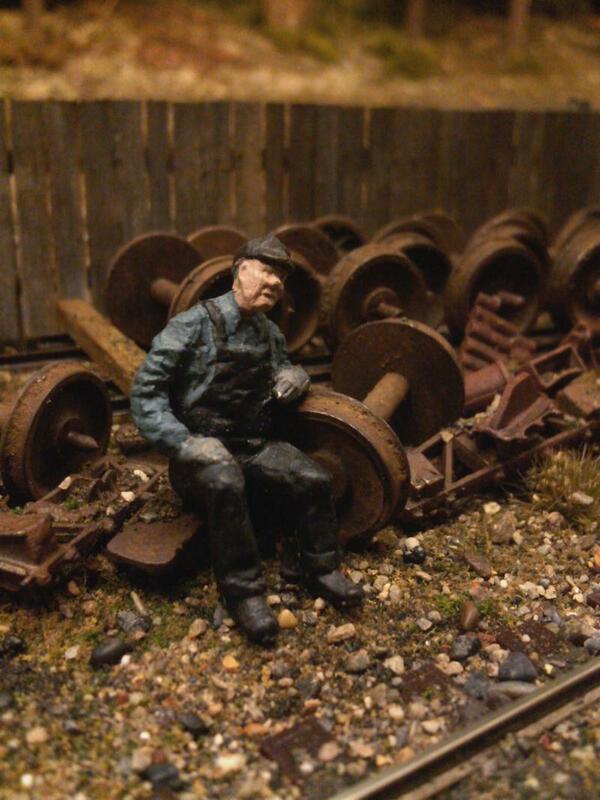 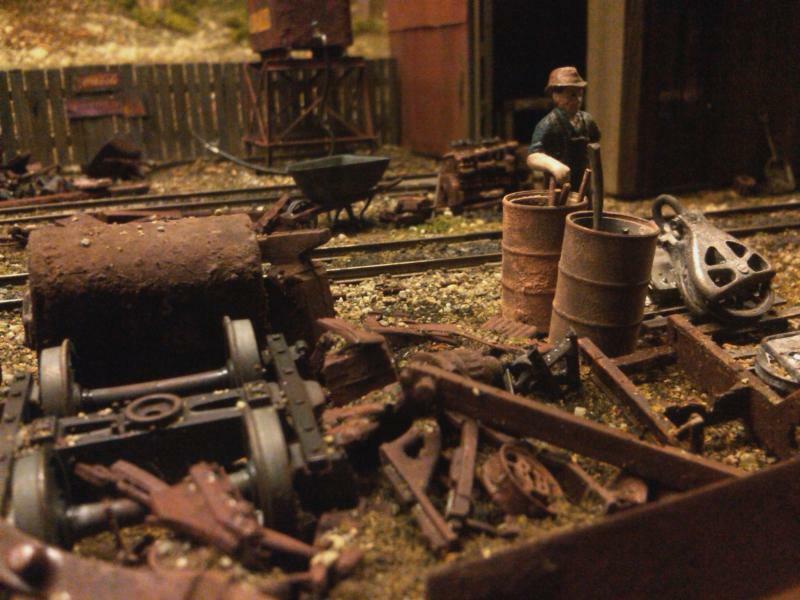 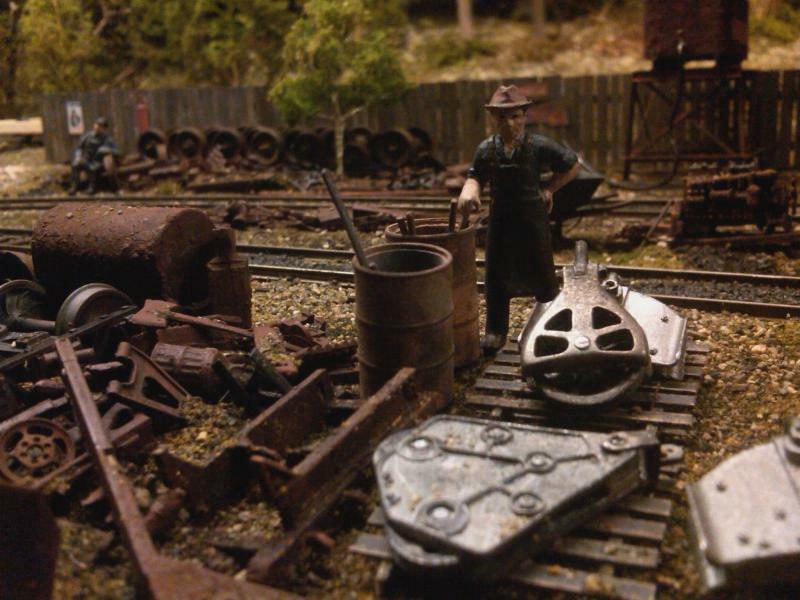 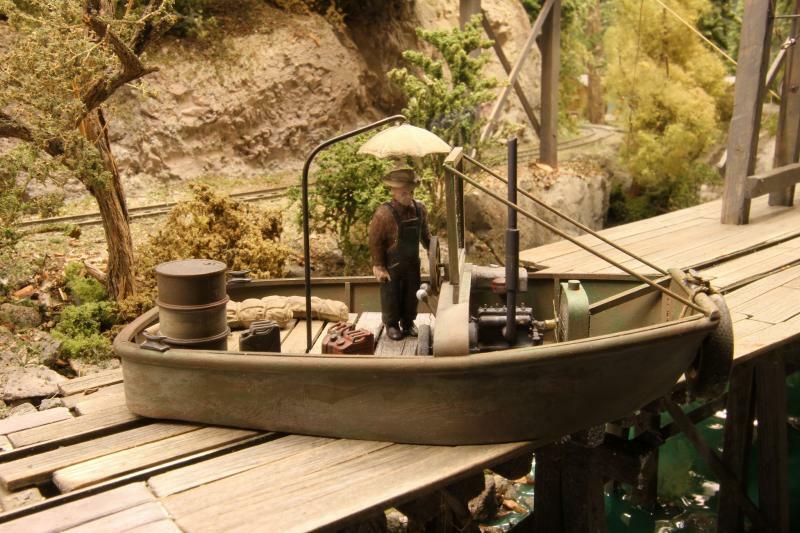 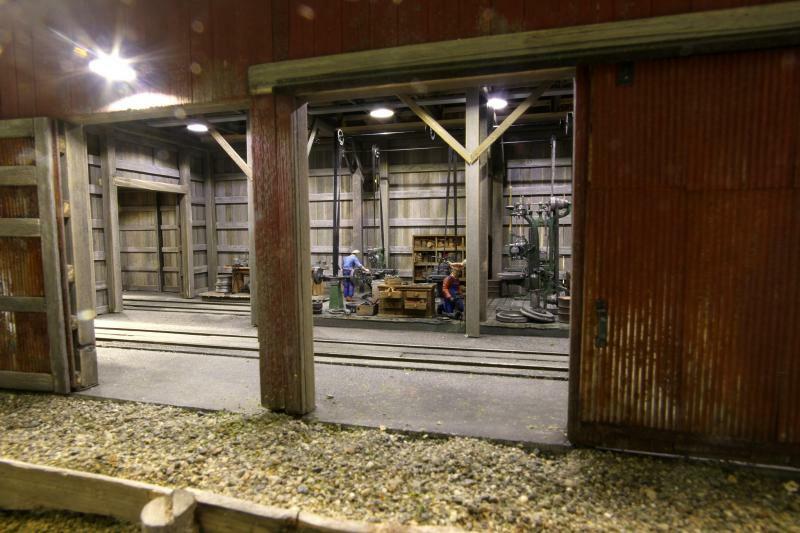 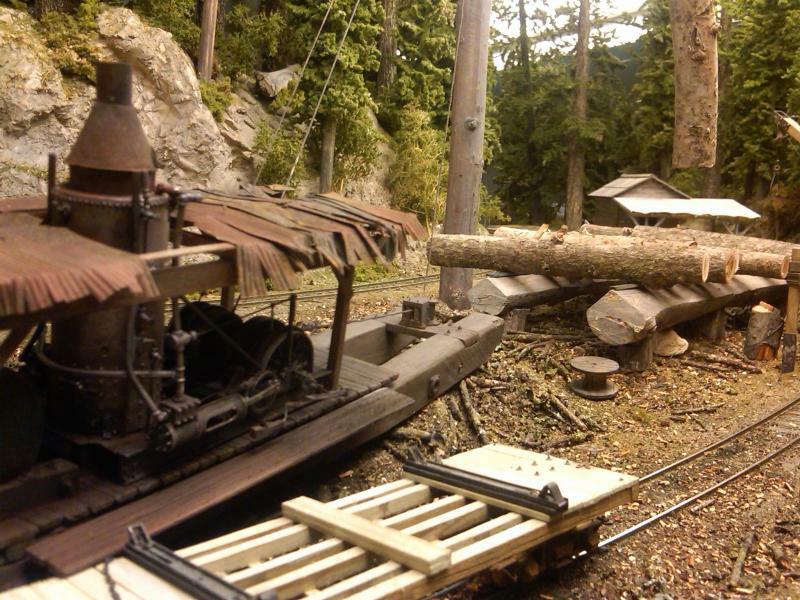 We our very fortunate as we will be in the May/June 2012 Narrow Gauge & Shortline Gazette, look for Brian's photo's there and an article detailing our layout. 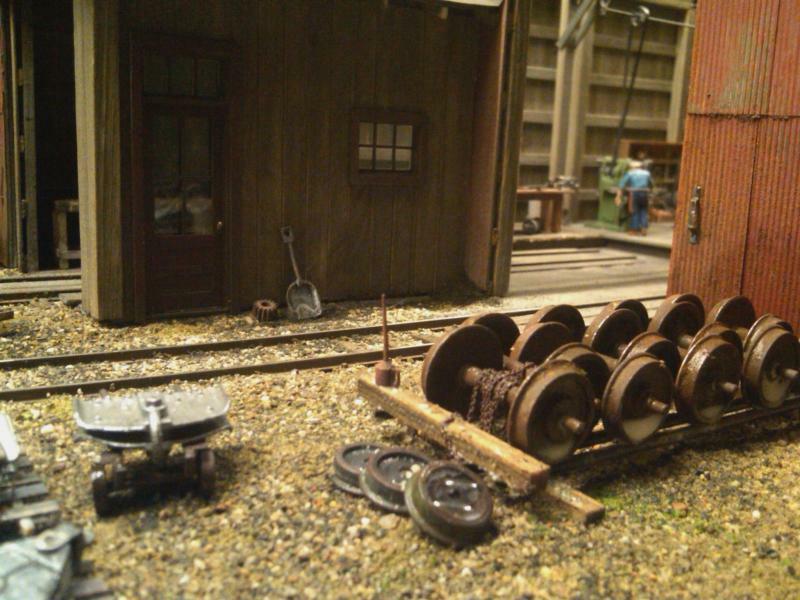 Updated May 5th 2012, Happy Anniversary to us, it has been 2 years to the day since we began the physical construction of the layout. 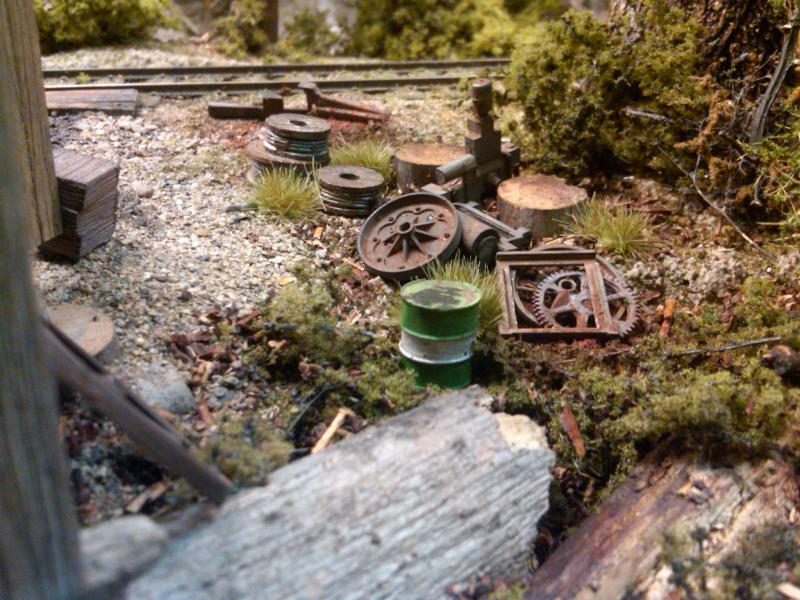 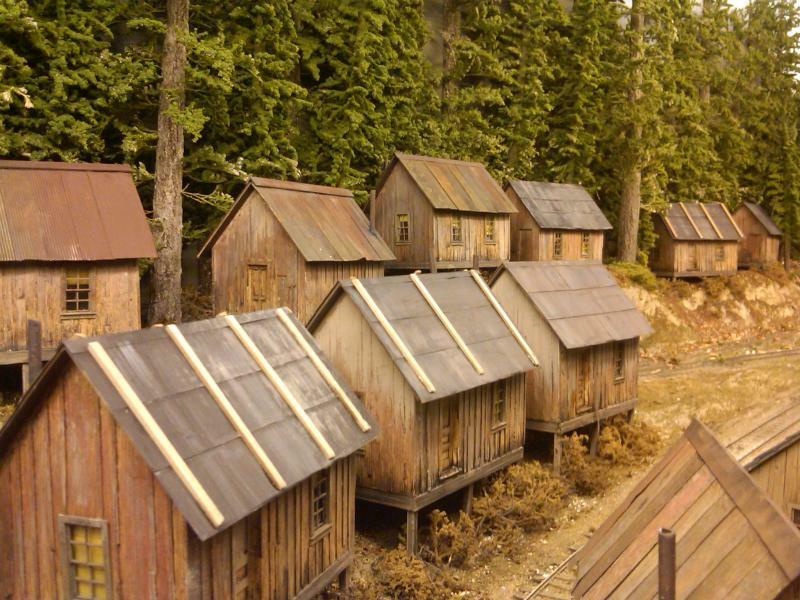 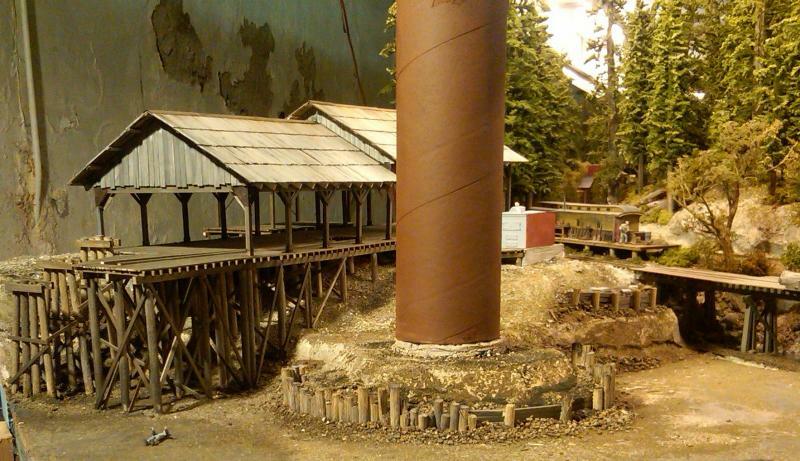 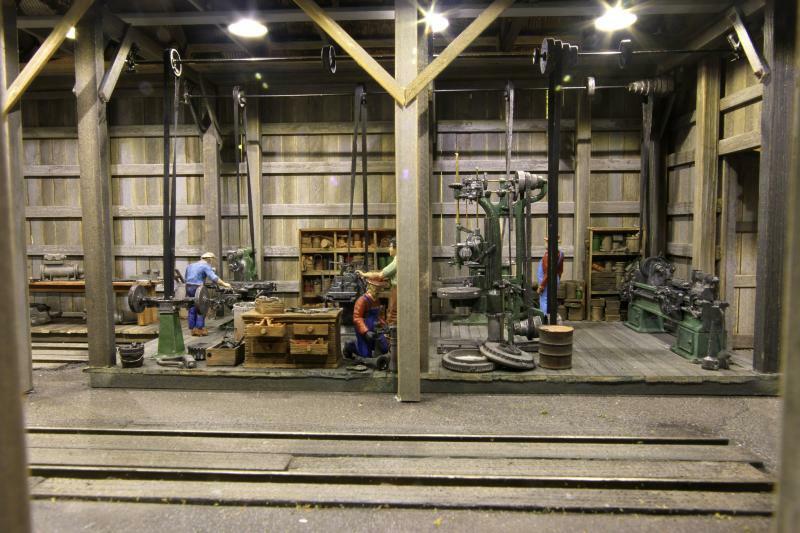 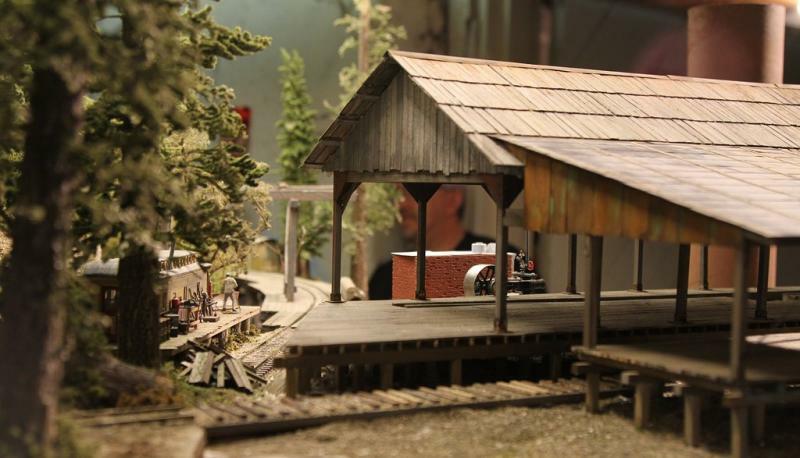 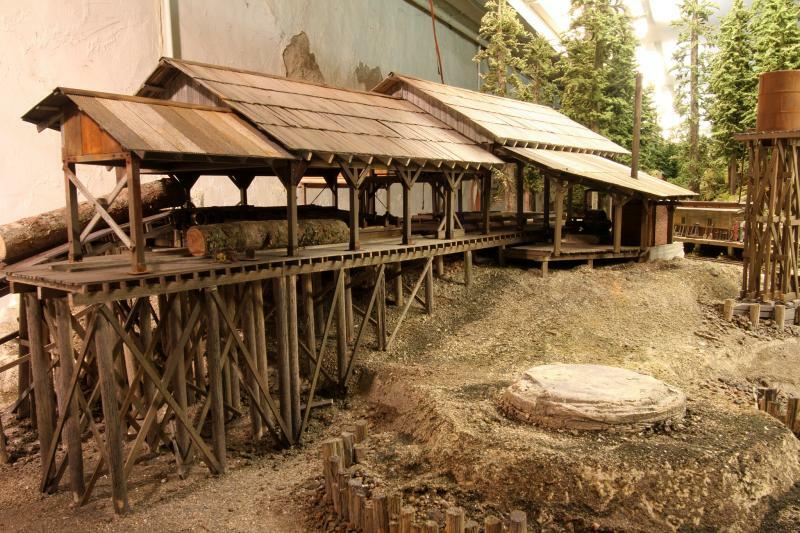 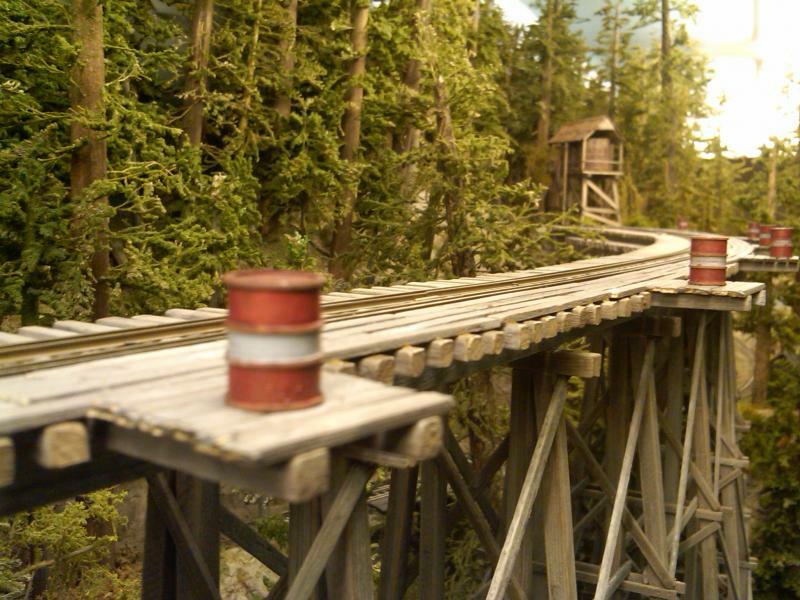 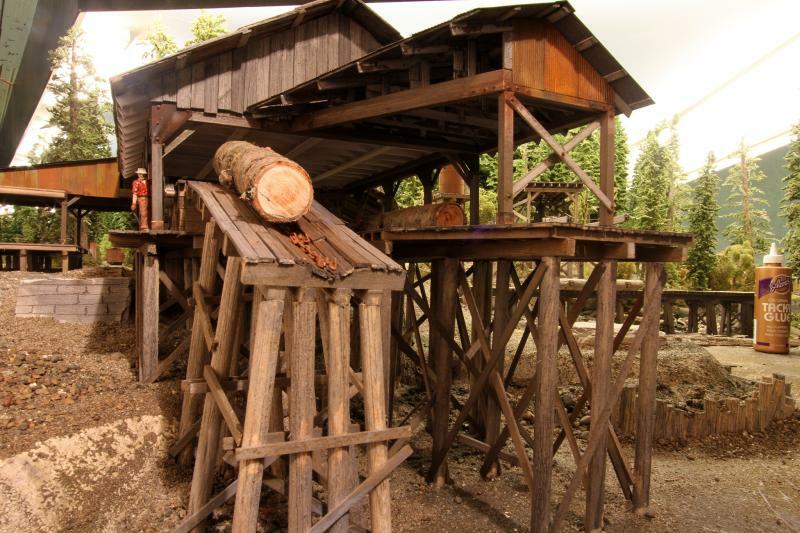 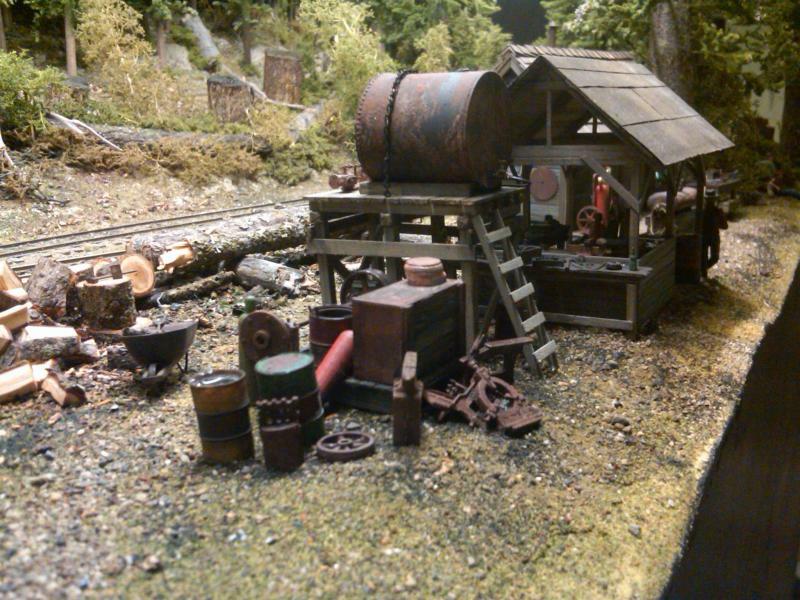 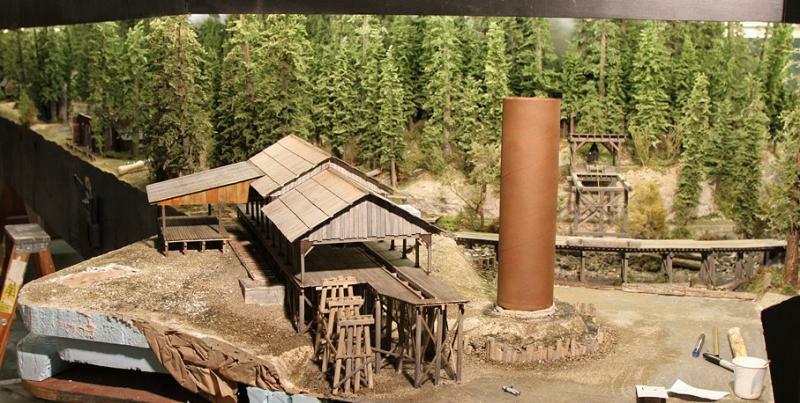 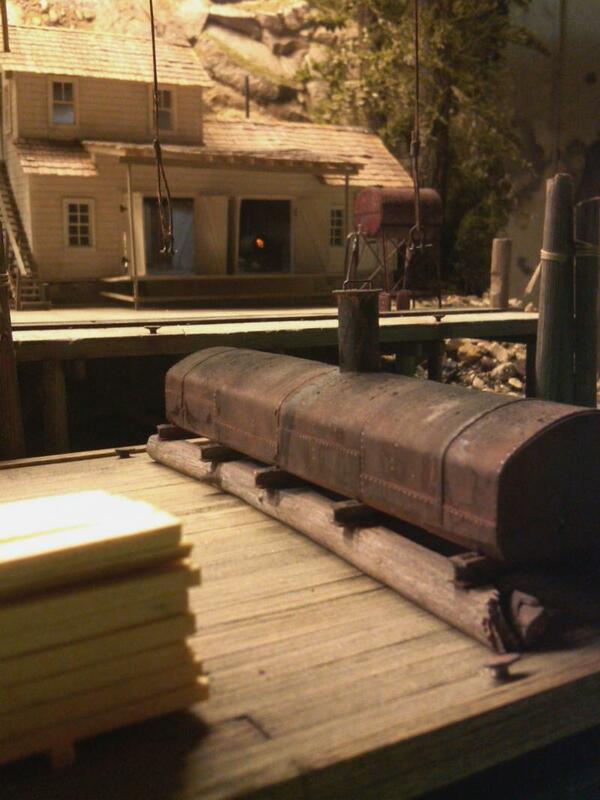 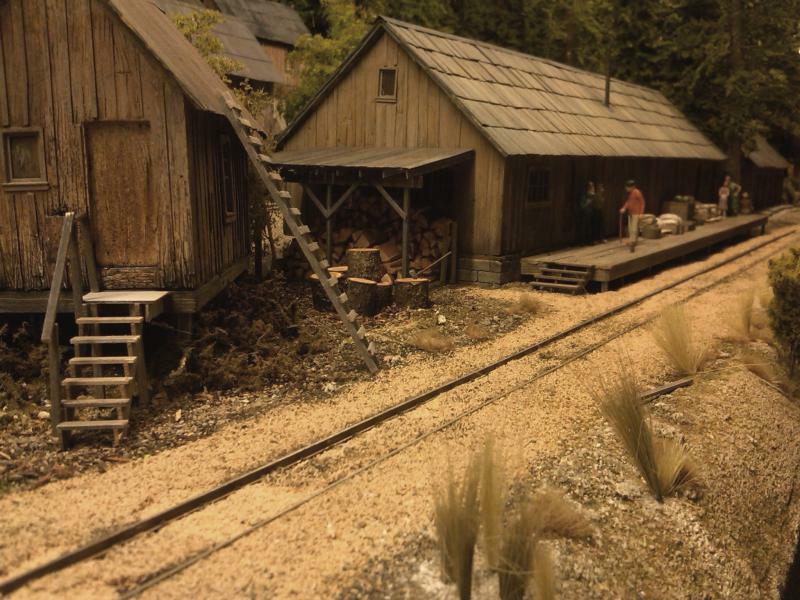 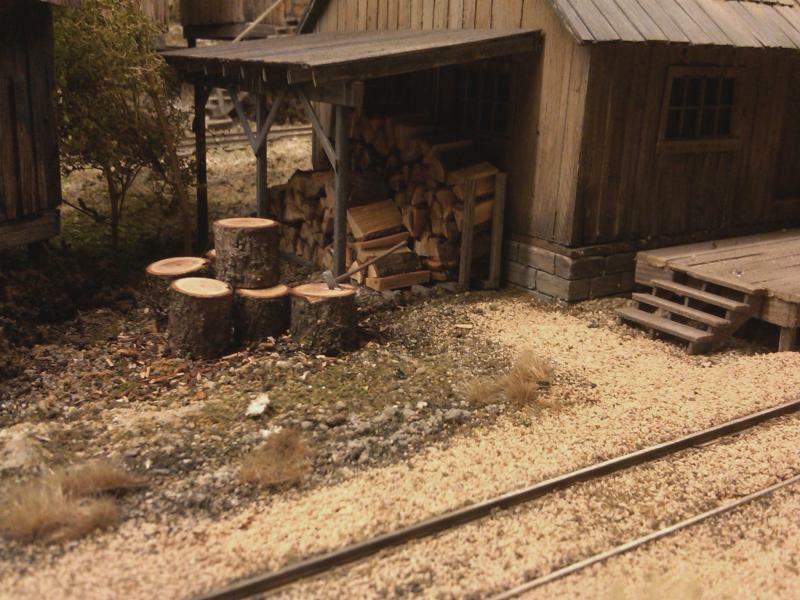 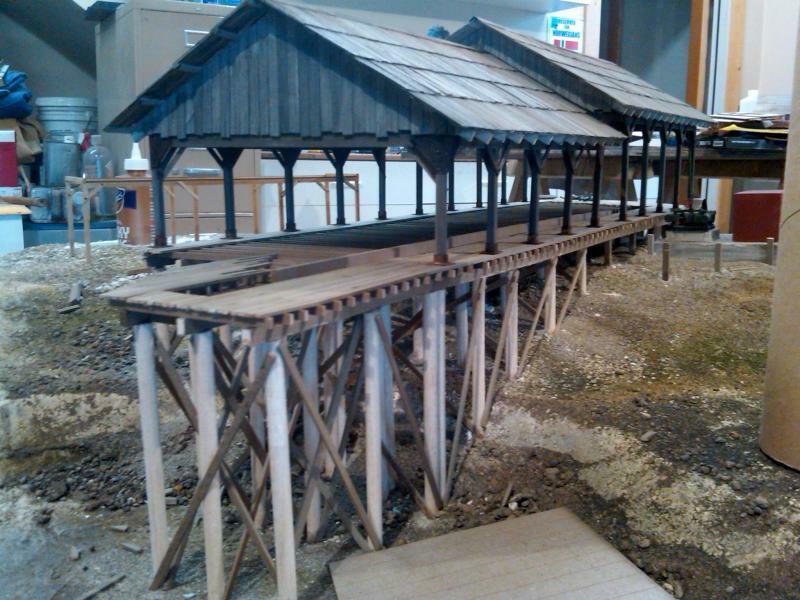 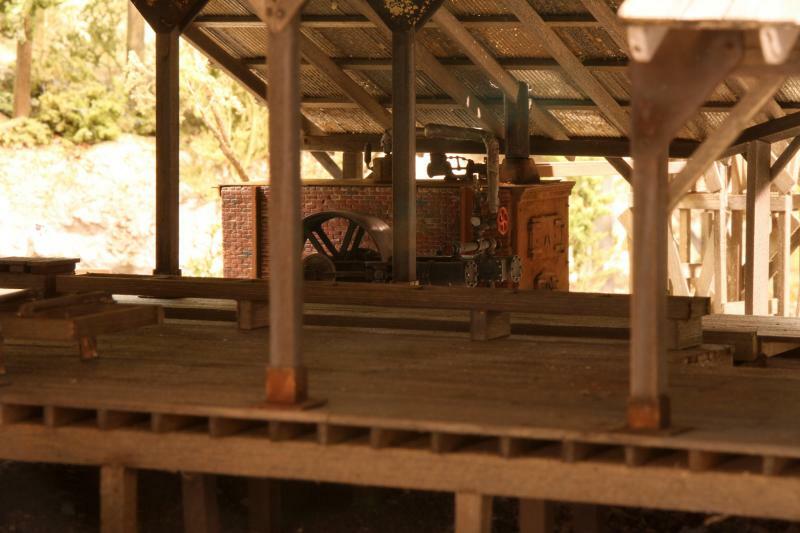 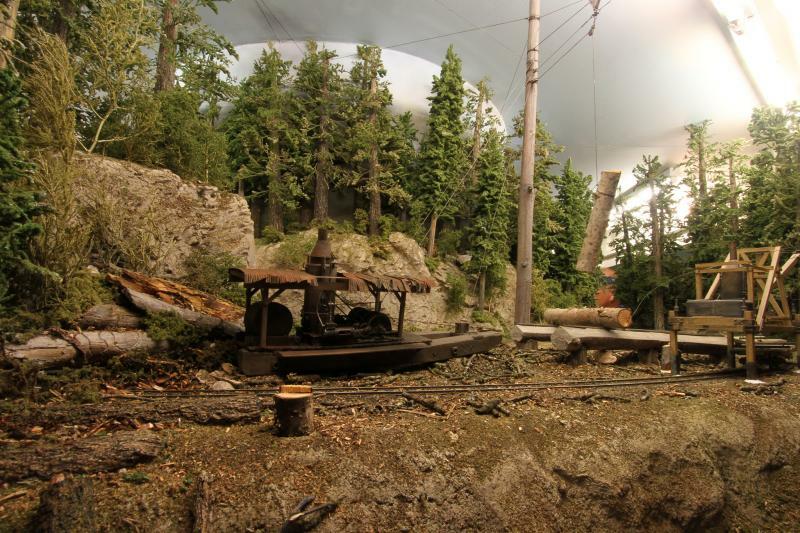 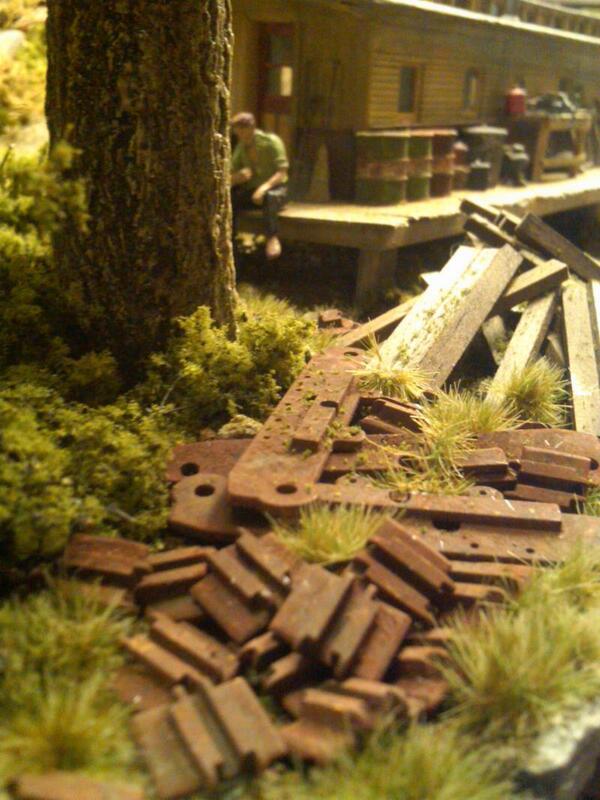 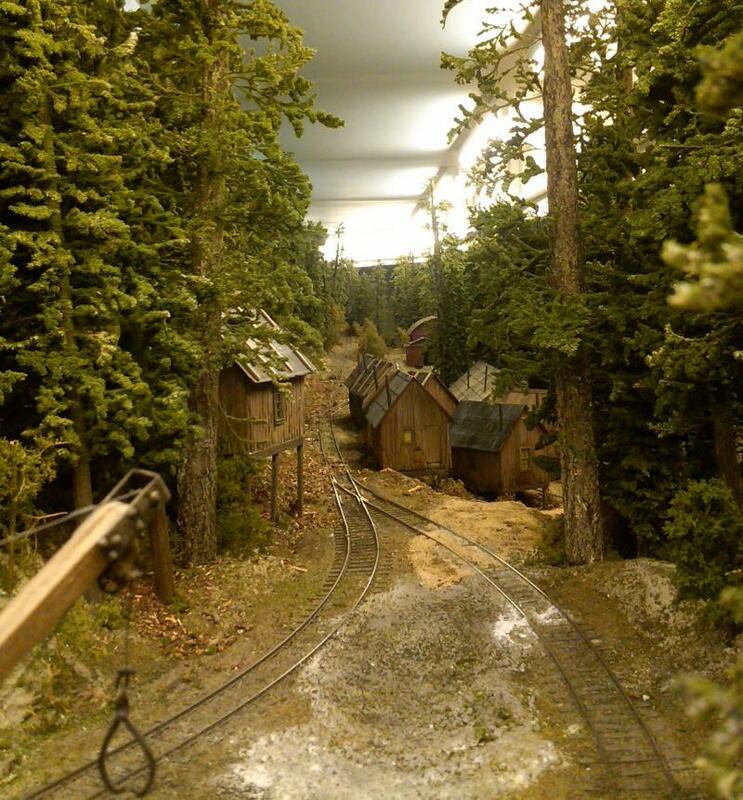 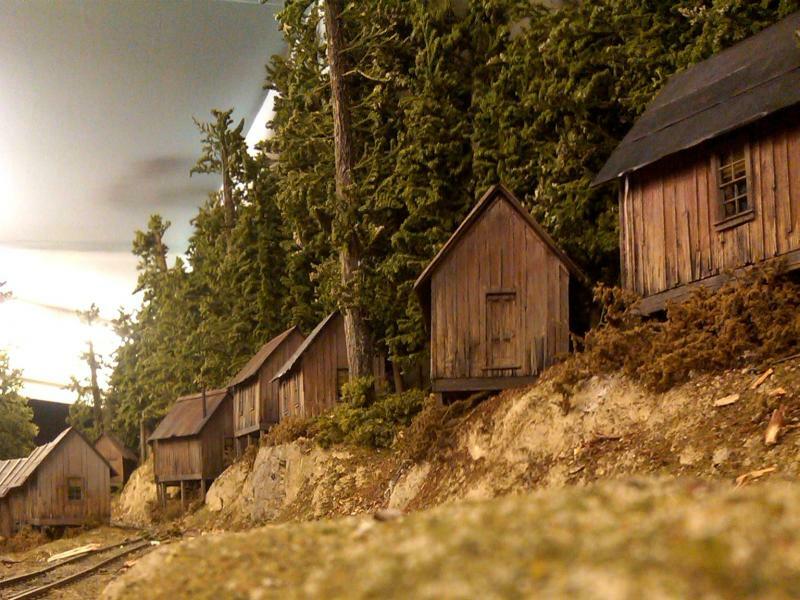 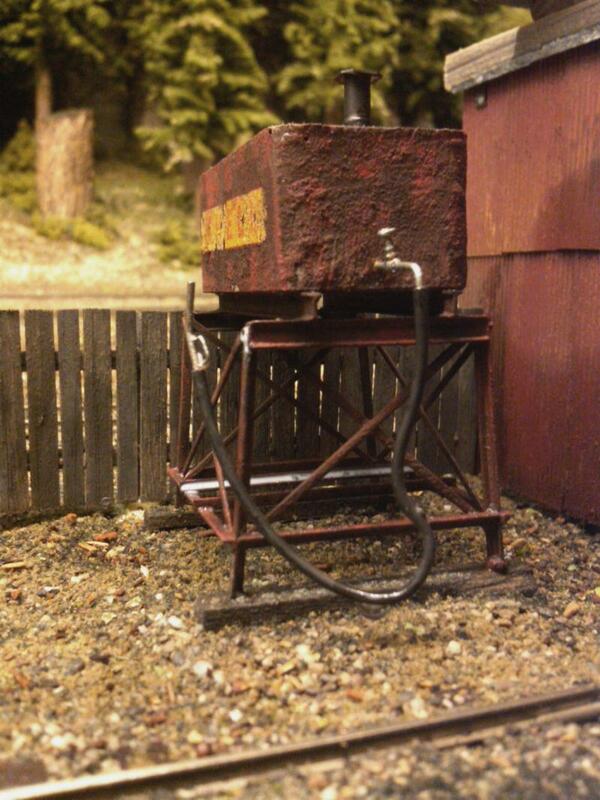 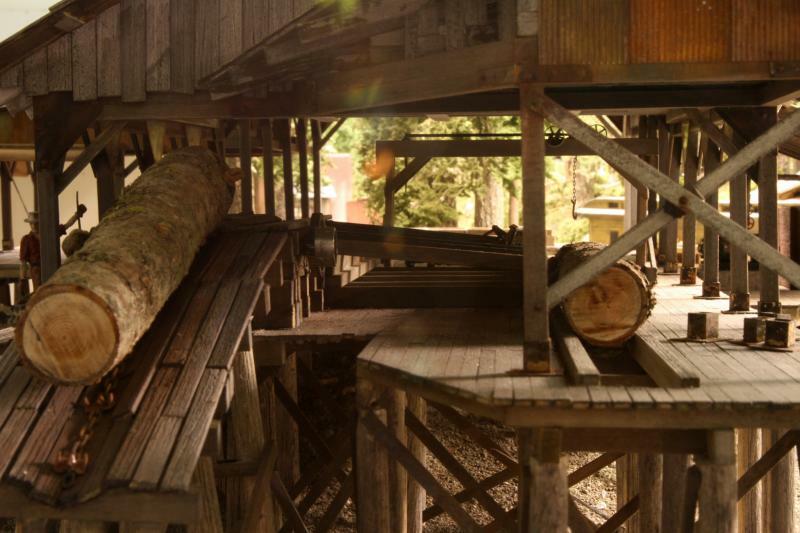 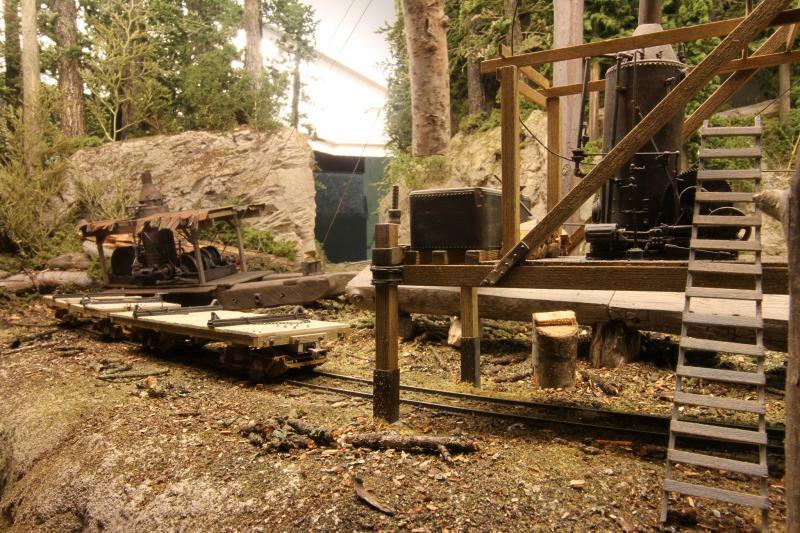 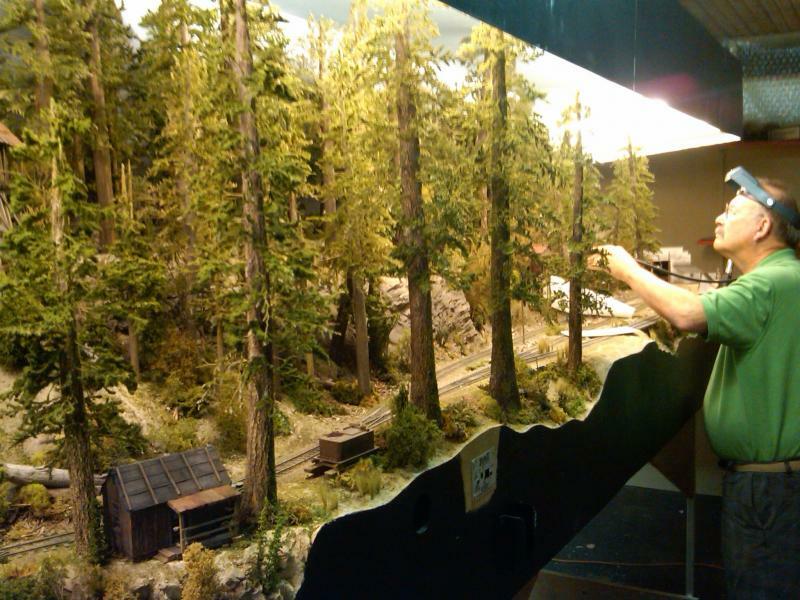 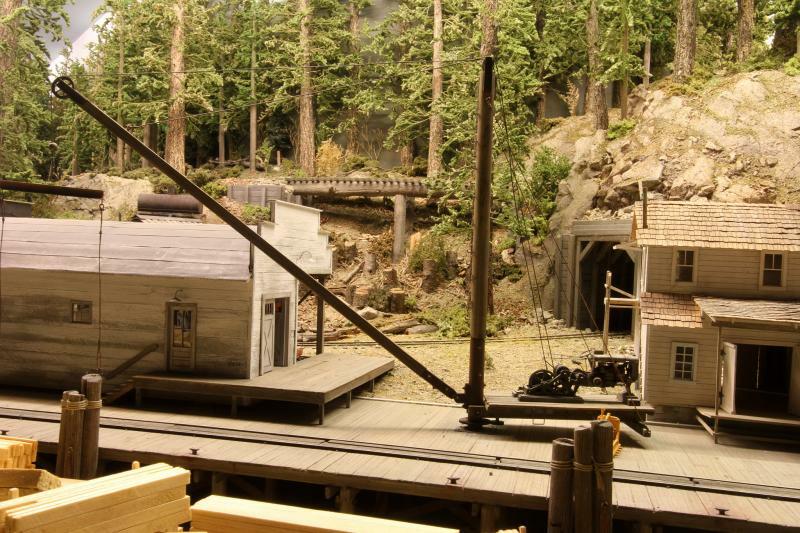 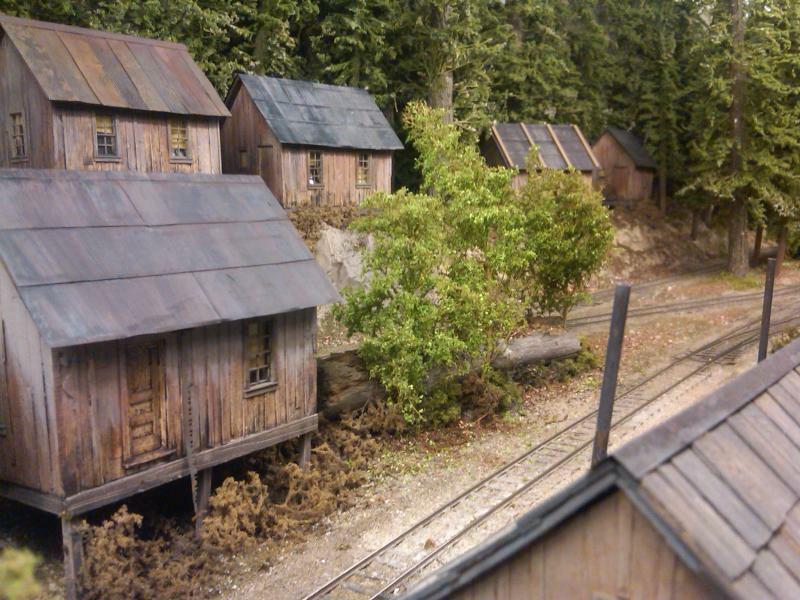 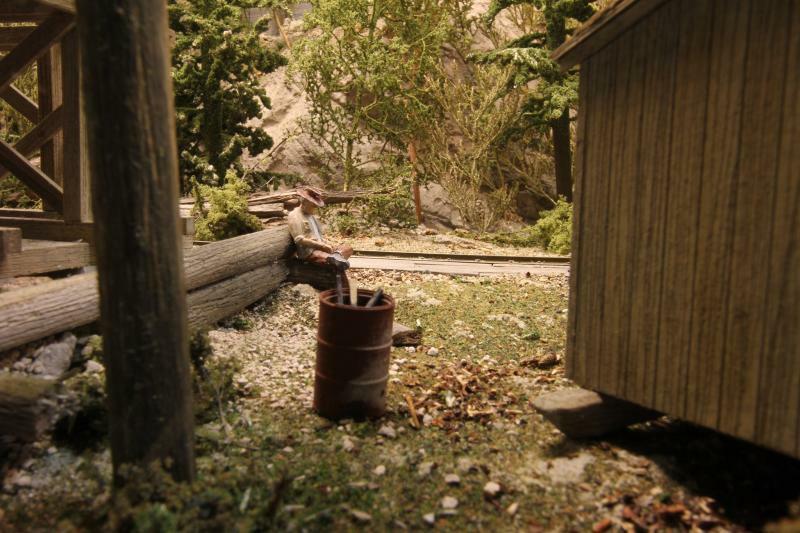 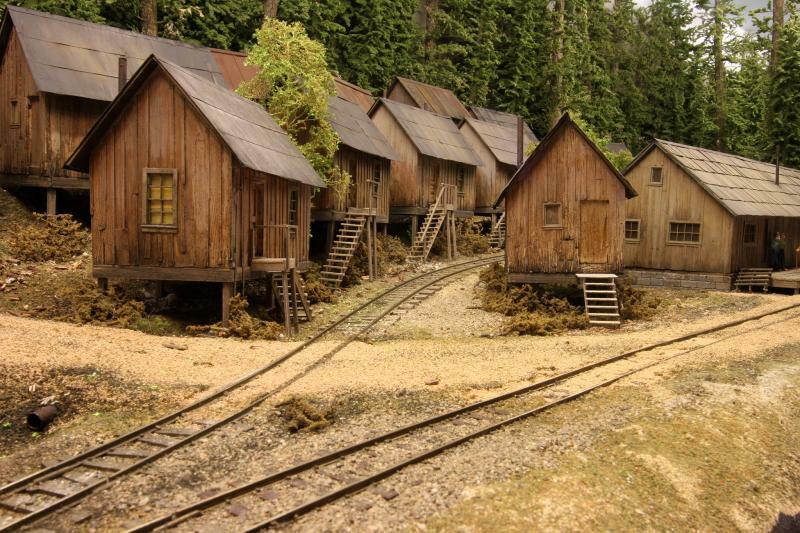 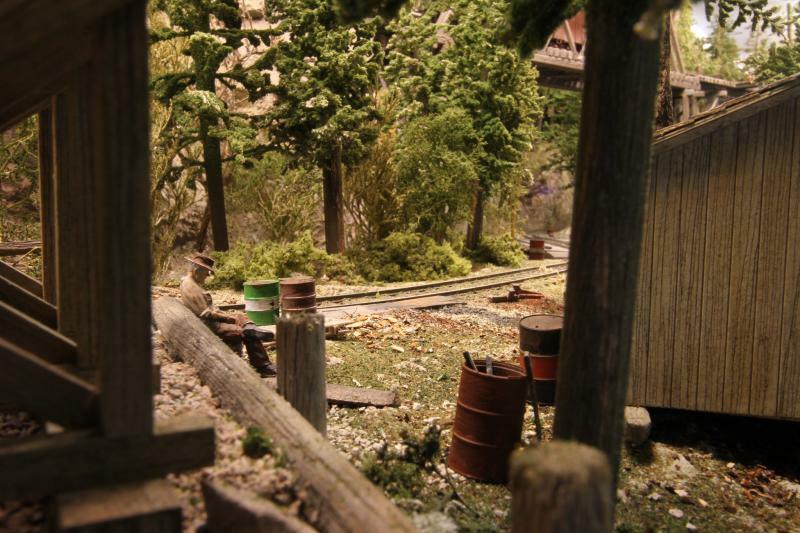 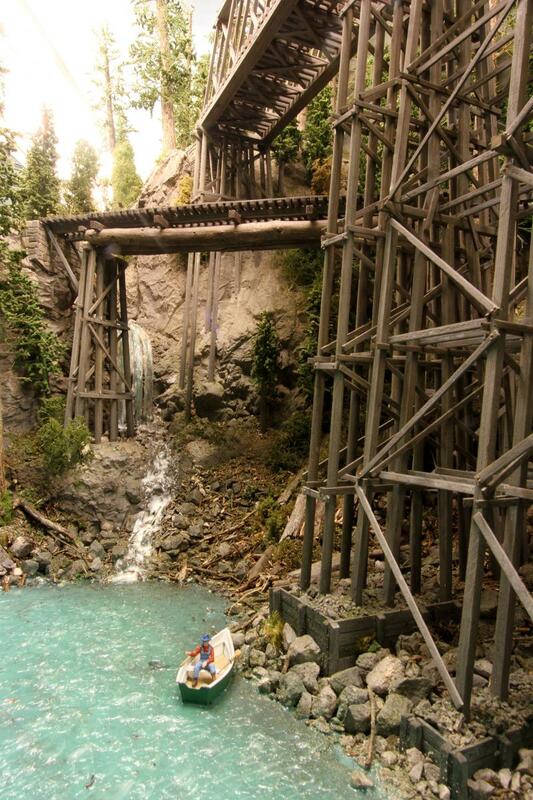 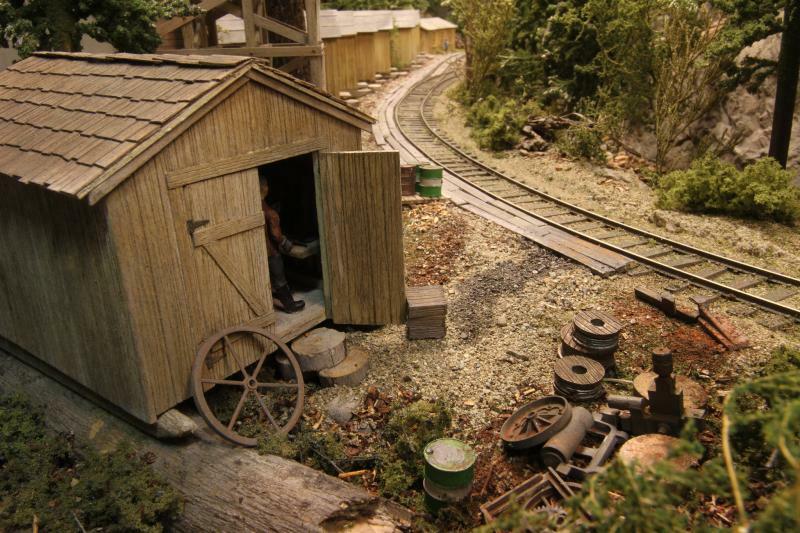 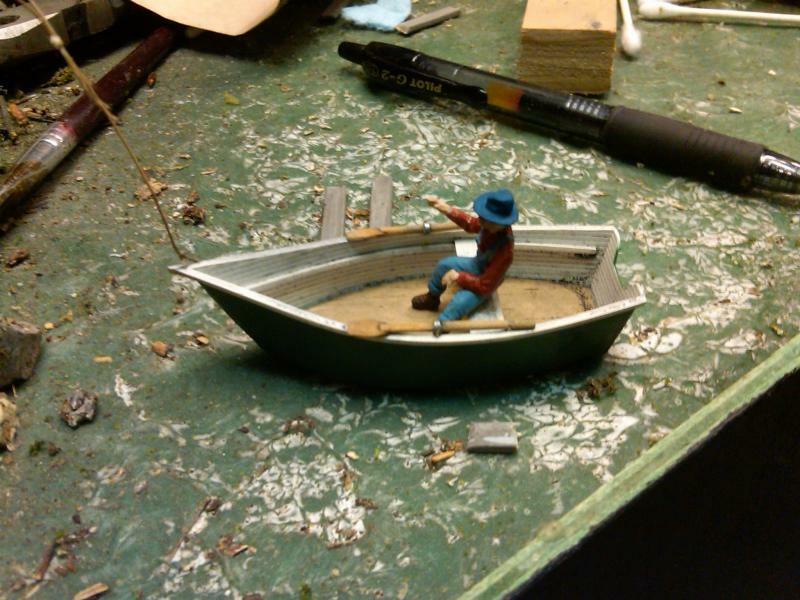 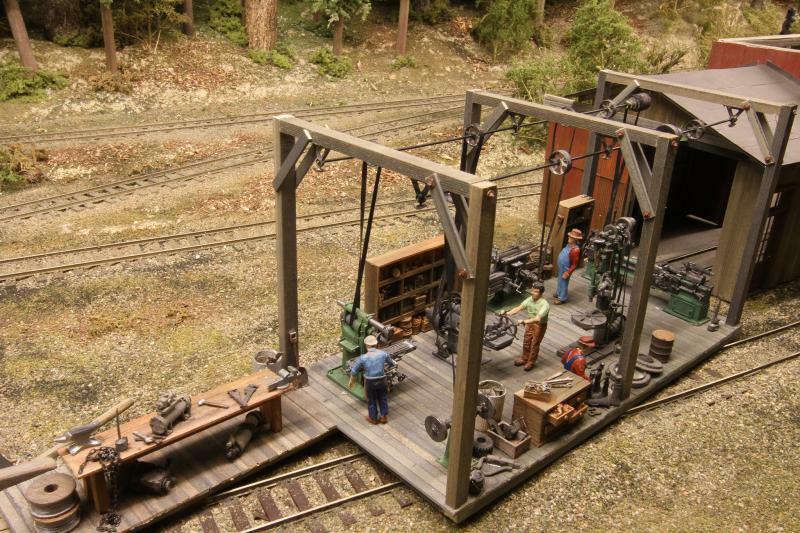 I celebrated by placing the 16 logging cabins on the layout as well as nearly 50 trees. 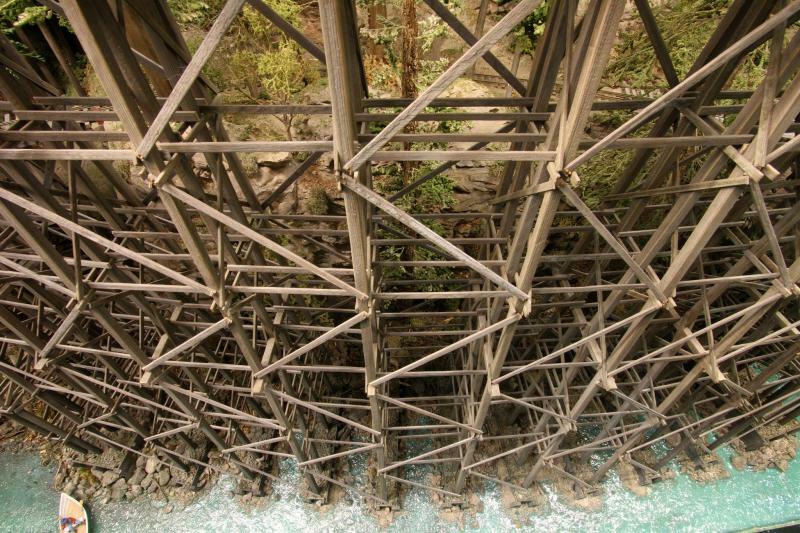 The unfinished Gap is pretty much closed. 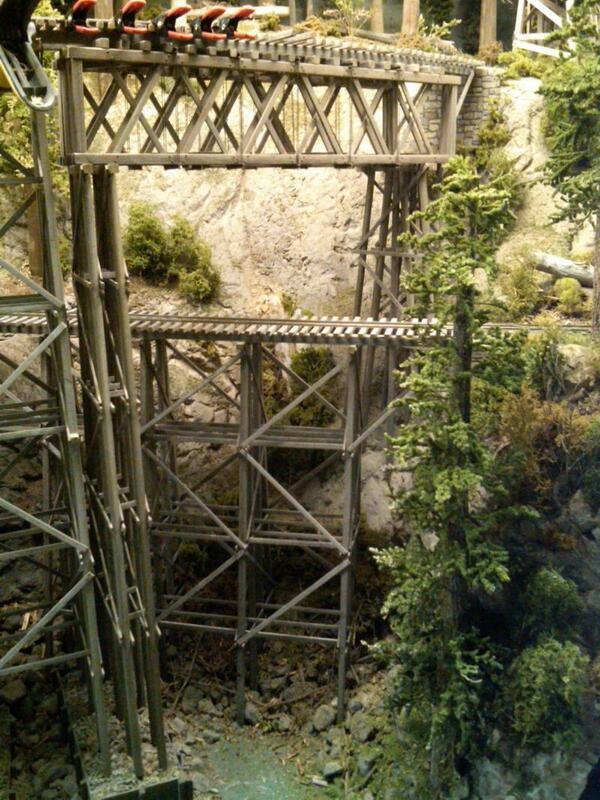 Major scenery will be complete in a week or two.